SOI is a principles based approach (think: strategy of preeminence and empathy-lead marketing) to attracting the right people into your world and filtering out everyone else. SOI goes way beyond simple audience and list building; it’s about creating marketing that PULLS (the best) people towards you, your business, and the products you sell. 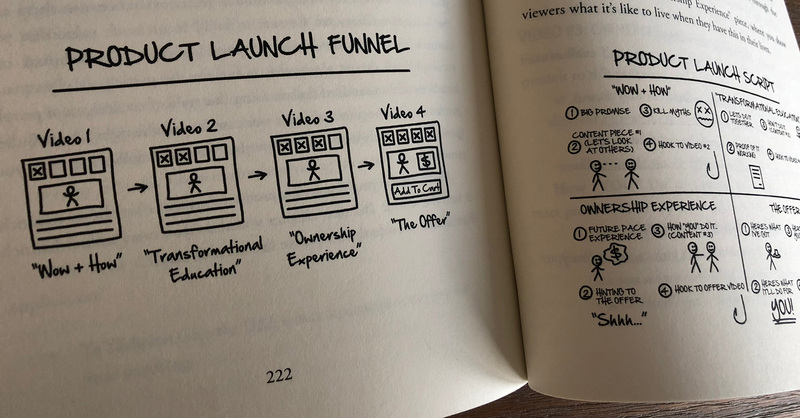 TIP: The big secret is to have better prospects / customers / clients, and optimize for them from the very beginning (from the very first touchpoint). If this resonates with you, read on. What I have will delight you and help you create deeper connections with your people and customers. 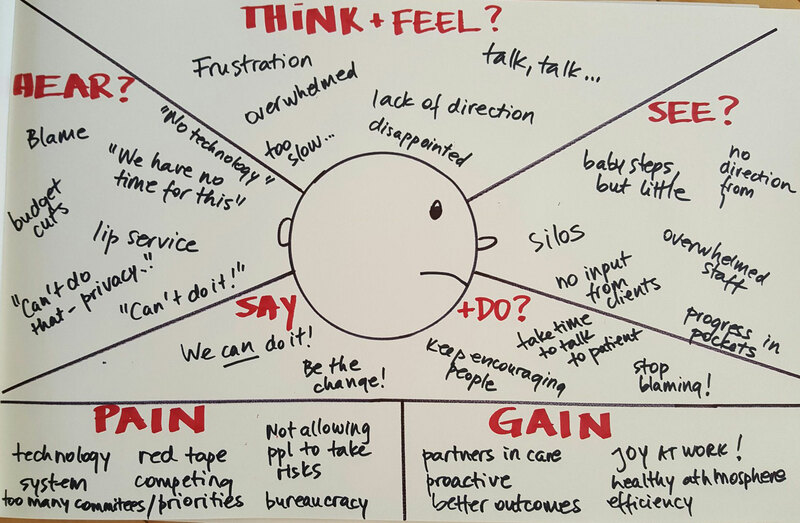 Coercion-Driven vs. Empathy-Driven Marketing Many years ago — around 2005 — I figured out an interesting “side-effect” of a type of marketing I had adopted and bet the farm on…. I was fortunate to go through the beta version of Sphere of Influence after many years purchasing anything and everything that André has offered. Sphere of Influence sets the stage for everything else – it’s an MBA + PhD education in creating an effective, customer-centric, value-driven business in the 21st century. More importantly, Sphere of Influence is a way of seeing the world that’ll forever change how you do business, for you and for your customers. André has created a masterpiece of deep strategic thinking combined with hard-hitting, practical, actionable advice. 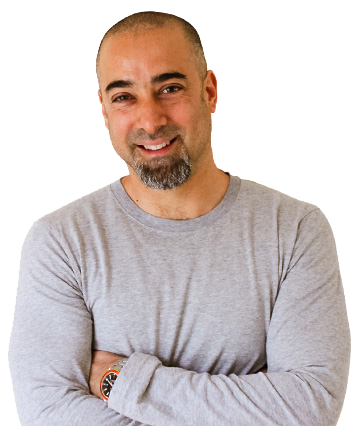 Professionally, I’ve been on the front lines of the Internet marketing community’s evolution over the last two decades and Sphere of Influence represents the new reality of doing business online. The wild west days are over, replaced with an emphasis on delivering real, sustained value over time to a group of customers you care about. There is no better guide for your journey into this new world than André Chaperon — year after year he has consistently walked his talk living and doing business by the same principles he teaches in Sphere of Influence. Stop whatever you’re doing right now and buy it. It’s worth 1000x the price because the moment you embrace its principles you’ll never be the same again. CONTEXT: Shawn has run somewhere north of $50 million in traffic over the years [AdWords and FB] for himself and his clients. Shawn created our paid traffic module in SOI. 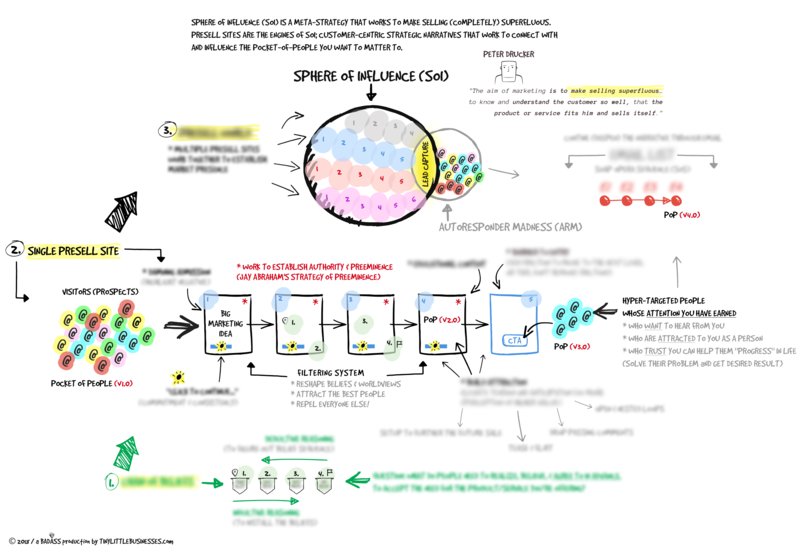 Sphere of Influence (SOI) covers the entire “front-end” of the marking funnel (in a unique and different way). By front-end, I mean everything that happens leading up to someone adding themselves to your email list or taking a desired action. The distinction of PULLING (what SOI teaches) and PUSHING (the majority of direct response marketing) is an important one. The dynamic (PULLING vs. PUSHING) changes how people see and respond to you. The former is a person whose attention you have and control, the later being your typical distracted attention deprived “goldfish” prospect. There is more to SOI than this high-level, of course. The nuances is where all the leverage is; the between the lines stuff. Once you know the basics, the breakthroughs come in the nuances. Instead of shallow content, shallow communication, shallow connections, in SOI we do deep. Instead of creating content for “everyone” to snack on, we filer out everyone and create DEPTH and NUANCE for just “a few people” who care to be PULLED in deeper. This is the essence of what SOI is about. SOI will teach you how to be a better marketer. You’ll learn a strategic principles-based skill that’s transferable to the marketing you already do, and the marketing you’ll do for years to come. Marketing that won’t become “stale” because what you’ll learn is not based on shortcuts, hacks, loopholes, or some flavor-of-the-month tactic. SOI isn’t about product launches. It’s not about engineering promotions. Not directly, anyway. Rather: You’ll learn how to create empathy-lead marketing that connects emotionally with the people you seek to serve. You’ll learn how to move people from prospect to customer because you’ve demonstrated you understand their problem, and have a solution they care about and want. When you do this well, “selling” becomes superfluous. It’s a thing of beauty when you create an asset that behaves like this. You’ll learn how to create human-to-human marketing that matters to just the few people you seek to serve. If this resonates with you, the method I’ve codified into SOI will blow your mind. It’ll reframe marketing for you. And, I have no doubt, will change the game for you. You owe it to yourself, and the people you seek to serve, to become a better marketer, and SOI will show you how. If you have any (pre-sales) questions, let me know. I’m here to support you. 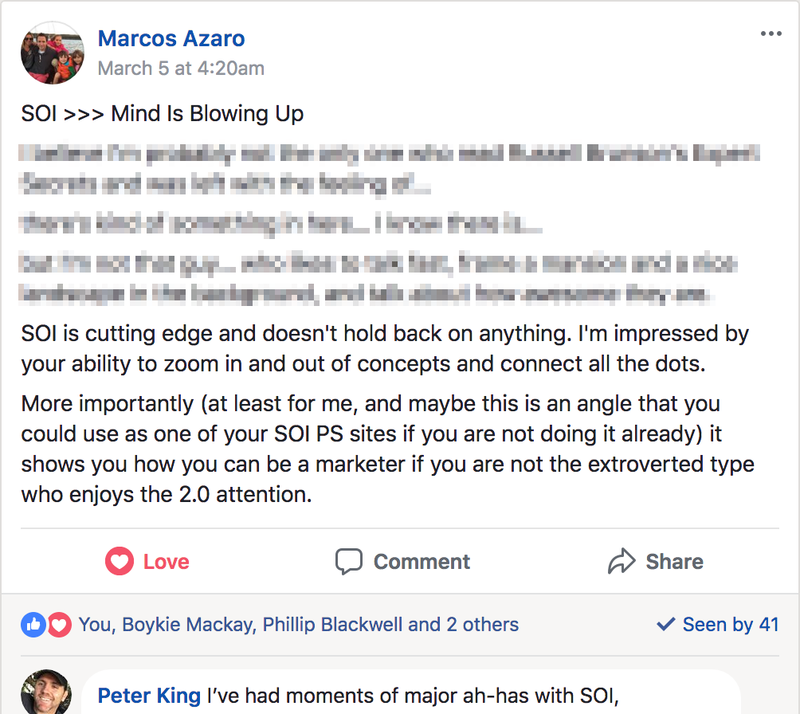 If you’re still on the fence, below is a small sample of (unsolicited) responses I’ve had from customers about SOI. Back in early 2016, I decided to start the complicated process of “codifying” Sphere of Influence. As you now know, it’s the process (method) I use to attract people into my fold, rapidly bond with them, and then turn them into SUPER-FANS (meaning they buy everything I put out). This was incredible! It brings together so many things that I have been thinking about recently. I have so much to say and so much feedback, but I will let it sink in, a little, before I post it. 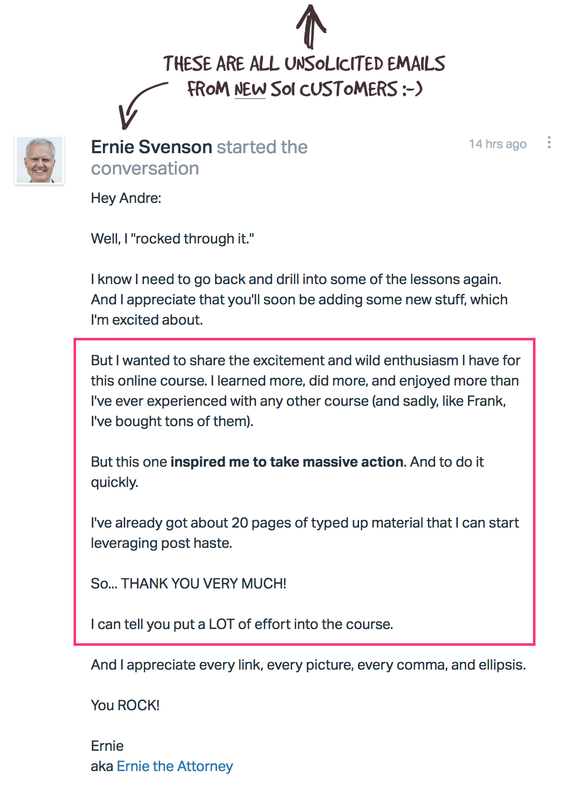 Thank you for this course Andre. I really appreciate and will use it build awesome things. Andre, hats off to you. SOI is to launches what ARM was (still is) to those big dinosaur guru email lists — that unpredictable comet that comes out of nowhere and resets everything. Anyone who’s done their own launch or worked on a client launch can tell you it’s like arm wrestling the love child of Dwayne ‘The Rock’ Johnson and a giant squid. It’s not going to be pretty and it’s near impossible to get that big win. SOI changes the game! Low customer pressure (that’s a game changer by itself), automatic lead nurturing, belief chain management and ultimately framing the product as the only solution to the prospects issue! Those who roll this out will quietly and surely start to dominate their market (and I’ve got three in the build stages already). It’s all about the long-game for me now. (tips hat to Andre ). VERY well done sir. Phew, just been over the whole sequence once again and I’m blown. There are so many fireworks going off in my head I don’t even know where to start. Will re-look at the whole thing again later this evening and see about adjusting my 12WY plan. This is an amazing piece of writing and hugely helpful, thanks Andre! I’ve been hungry for you to teach this and your explanation of it, especially in Part 2 was incredible. In the 3 years since I niched myself down into providing IM services (ranking, conversion, lead gen) to roofers, I’ve been thinking about the Frank vs Matt example and fleshing out the characteristics of each. Now I’m already seeing how the story will unfold and where I’ll insert it into the story for the launch of my new community for roofing contractors. An incredible Christmas gift. Thank you! Andre — Just finished this training. Well done, Sir! You’re very generous to give away this wealth of information. It’s invaluable. This is by far your best pre-sale site. Almost every product (plus an affiliate product) is included. Either through Invisible Influence or through your other PS sites that you link to within the training. Absolute brilliance. It’s like a lesson within a lesson. Wishing you and Anita a fantastic weekend.